The U.S. Department of Agriculture’s Farm Service Agency (FSA), as a lender of first opportunity, has expanded its support of beginning farmers and farmers participating in emerging markets by offering microloans. 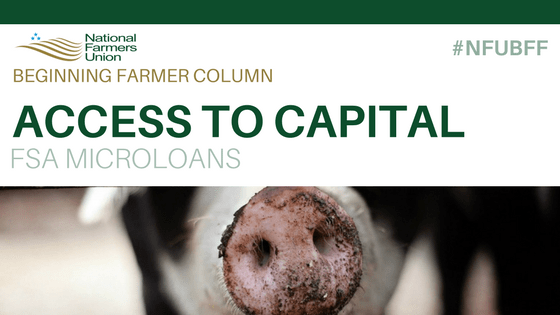 These loans were first introduced in 2013 and were specifically authorized in the 2014 Farm Bill. There are two types of microloans: direct farm ownership microloans, which can be used to pay for farmland, operational facilities, and conservation projects, and direct farm operating microloans, which can be used for inputs, equipment, irrigation, certification costs, marketing and distribution expenses, and other operational endeavors. How are microloans different than other FSA loans? For one, participating in the microloan program does not count towards the total time borrowers are allowed to work with FSA before having to graduate to private credit. Additionally, the farm experience requirements for eligibility are more flexible for microloans than for other FSA loans. In lieu of farm managerial experience, the program allows small business experience, any farm experience, and self-guided apprenticeships to count toward the minimum experience thresholds. The application process is streamlined because loans are capped at $50,000; ownership loans do not require property appraisals, and operating loans accommodate lenders without production yield history. Applicants are notified if their application is complete within 10 days, and are notified of a loan making decision within 60 days of submitting a complete application. Working with FSA is different than with other lenders because the agency has no flexibility to lend to applicants who do not meet eligibility requirements, but conversely will not decline a loan application from a qualified applicant when the necessary funds are available. Interested producers can learn more here and check FSA loan interest rates here. Prospective borrowers will need to visit their county FSA office to submit an application.